Sri Lanka’s openers, Tillakaratne Dilshan and Tharanga Paranavitana, gave their team a solid start to the first Test in Cardiff before England’s bowlers hit back on a truncated day. The pair added 93 for the first wicket after play was delayed until mid-afternoon by regular showers, but Dilshan couldn’t build on his half-century and Kumar Sangakkara also departed in somewhat controversial circumstances when the DRS became involved. 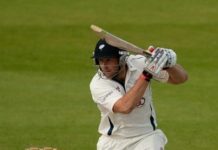 Graeme Swann provided the first breakthrough and James Anderson was in the middle of a testing spell when England appealed for a Sangakkara edge behind but Aleem Dar turned down the shout and Andrew Strauss was quick to use the DRS. The decision rested on a combination of a noise and a faint mark halfway up the bat as the ball scooted past the edge. Rod Tucker, the third umpire, relayed that information and Dar overturned his decision. Sri Lanka’s opening partnership was their best in England, a place where touring sides often struggle against the new ball especially at this time of the year. They were also unfortunate that the dry, warm start to the summer ended on cue for the first day, but one of the main bonuses of Sri Lanka’s successful warm-up period was the form of the top two. Dilshan and Paranavitana both hit hundreds against Middlesex and England Lions in stands worth 209 and 200. In that sense, England did well to separate them for 93. A solid start here was vital, too, because Sri Lanka have a lengthy tail after opting for a five-man attack which, after a late change of heart, included two spinners. Strauss hadn’t been unhappy to lose the toss, especially when another shower meant an awkward 70-minute session before tea, but it soon became clear there wasn’t going to be a huge amount of help for the quick bowlers. There wasn’t much early swing for Anderson and Stuart Broad bowled too short, reinforcing the feeling he is short of rhythm after just two Championship matches for Nottinghamshire and his injury-hit winter. As was to be expected there were the occasional alarms for the openers but they judged well what to leave and what to play to build the frustrations for the bowlers. Against his natural instincts Dilshan was restrained in the 16 overs before tea except for a flash against Anderson and a strong cut off Broad as he passed 4000 Test runs. Paranavitana was impressively solid and alert to the quick singles although was on the receiving end of two big appeals from England. The first was for a catch down the leg side which always sounded more like pad, but the second got Anderson excited as Paranavitana was squared up and the ball taken at first slip. Billy Doctrove was proved right, though, as the ball had flicked the batsman’s hip and Strauss had been wise to keep the DRS up his sleeve. The England captain is becoming a good judge of when to use the system. However, Paranavitana was never flustered and adjusted impressively for a man playing his first Test outside the subcontinent. Tillekeratne Dilshan: ‘Paranavitana played well’ After tea Dilshan came out playing more shots although England‘s bowlers did find the edges of both batsmen without anything reaching the slips. Chris Tremlett produced a probing spell that began to build some pressure and one delivery reared past Dilshan’s edge even though he was largely negated by a slow pitch. Swann had been brought on in the 27th over and while he couldn’t produce a first-over strike he was in the action in his fourth. At the start of the over Dilshan reached fifty from 92 balls, but three balls later dragged into his stumps as he tried to force through the off side. England sensed their chance for a late push and Anderson’s short battle with Sangakkara promised more for the series ahead. Paranavitana remained firm during the closing overs and brought up a hard-working and hugely valuable fifty from 145 balls when he cut Tremlett for his fifth boundary. 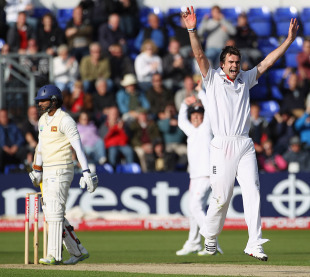 With Mahela Jayawardene for company plenty of hard work remains for England‘s bowlers.